What is the cause of smelly shoes? Everyone who frequently participates in sports or suffers from sweaty feet recognizes the odor of smelly shoes. Most people wear the same shoes for the whole day. The sweat glands in your feet produce about 250 ml of sweat every day. If you are troubled by sweaty feet, are physically active or wear closed shoes this can be even more. The warm, moist inside of your shoes is ideal for fungi and bacteria. These fungi and bacteria are the cause of your smelly shoes! What is the effect of smelly shoes? Besides the fact that it is unpleasant to have smelly shoes the smell often spreads throughout the whole room. Athlete's foot and nail fungus are also caused by bacteria and fungi. These are present in humid areas such as swimming pools, showers and saunas. But moist shoes are also a hotbed of fungi and bacteria. What can I do to get rid of smelly shoes? You can use our Shoefresh Shoe Refresher to prevent smelly shoes. The Shoefresh removes bad, musty odors from smelly shoes using Active Oxygen technology. On top of that is also dries wet shoes from the inside out using warm air. The Shoefresh is also a boot dryer, not only a refresher. 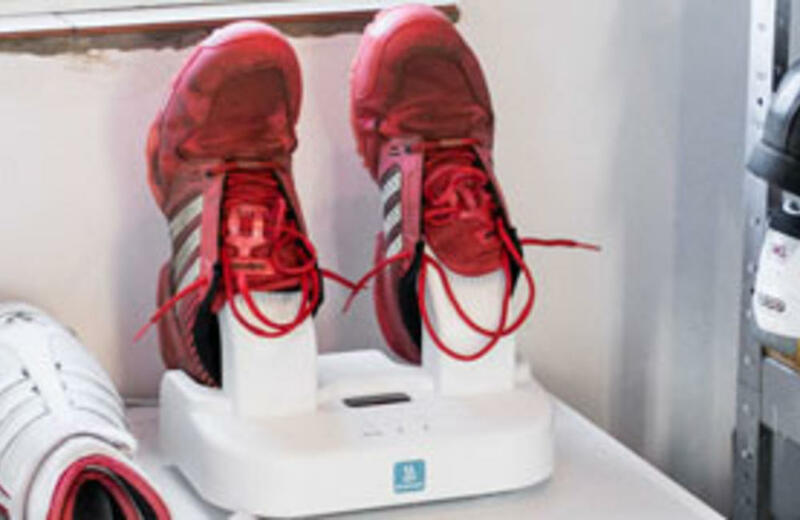 It is very easy to use: place your shoes over the holders and the program starts automatically. And only only for shoes! Also suitable for boots, shin pads, gloves and helmets. Click here for more info about the Shoefresh Shoe Refresher, the solution for smelly shoes. UK delivery within 1-3 working days.